Make a creative home on a budget? Challenge accepted! See how we do it through arts and crafts. And get free printables along the way! We don't just think outside the box, we paint it, reshape it, and glue glitter wings on it! CAT wants an Angry Bird birthday party this year. Being on a tight budget, I always start researching & planning months in advance. 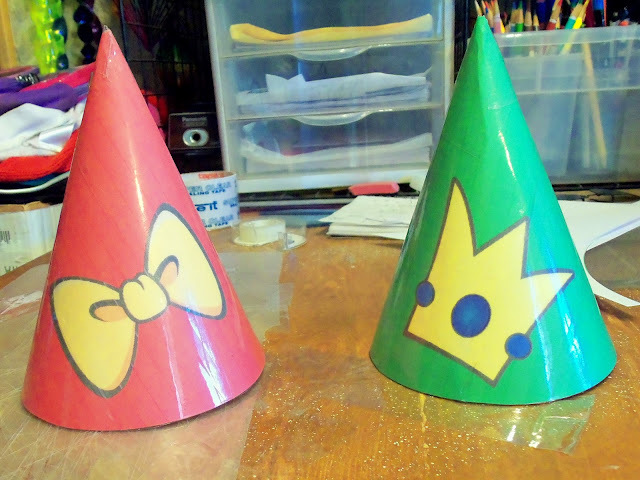 Today we made some test party hats. 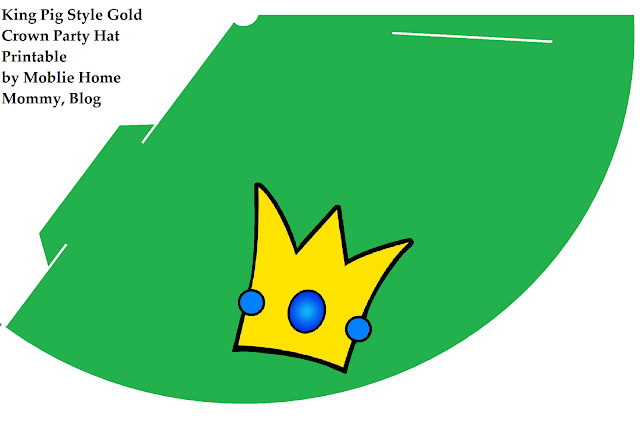 I created a simple & cute design featuring a girl bird yellow bow & a boy pig gold crown. I thought maybe some of you might could use them too. Here are the hats. I printed them on 8.5" x 11" white card stock. I used the fast draft setting, so the image is light, but I save on ink. That stuff is too expensive! I also use packing tape on paper crafts that I want to last more than a day with our 2 rambunctious little girls! That is why they are shiny. Quick view of the designs I came up with. Though I didn't see these anywhere, I wouldn't doubt that this style is made somewhere! 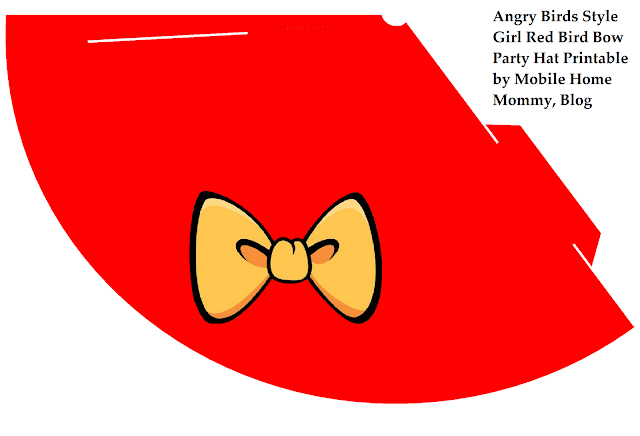 Here are the full-size free printable angry birds style party hats that I created in Microsoft Paint. Print each out on 1 sheet of paper or card-stock for a standard sized party hat. OR print TWO per Page for a smaller "fascinator" style hat. SUPER CUTE! Cut out, roll into cone, glue or tape together at joint, hole punch for strings to tie or elastic thread, & Enjoy! So the hubby is nearing the end of replacing the ceiling & some walls in the girls playroom. I have been busy sketching out ideas to paint on their walls. The room before wasn't bed, but I' not gonna pass up an opportunity to make it even more fun! There is a lot crammed into 7.5' x 12'. The major pieces of play furniture will stay. Moving out the large wood desk. Lots of artwork on the walls & some damaged posters that are ready to retire. Time for a refresh! Entire home floor plan below with playroom out to right. Since the space is small & only has 1 window, I want to create depth with light colors. I also want the design to be flexible for many years of changing fads for them. AND I want it to be simple to paint! Is that asking too much? I have asked CAT & DOT what they want. Castle & Angry Birds! OK, time to brainstorm. 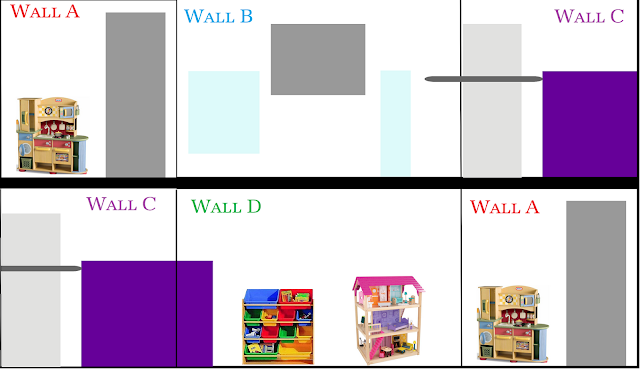 Here is my outline of the blank walls. I repeated the smaller side walls A & C so I could gt a feel for how the design will wrap around the room. Most of the work could be done on Paint only. So now on to Angry Birds first. They have cool backgrounds. Here are my favorites that I cleaned up with Paint. 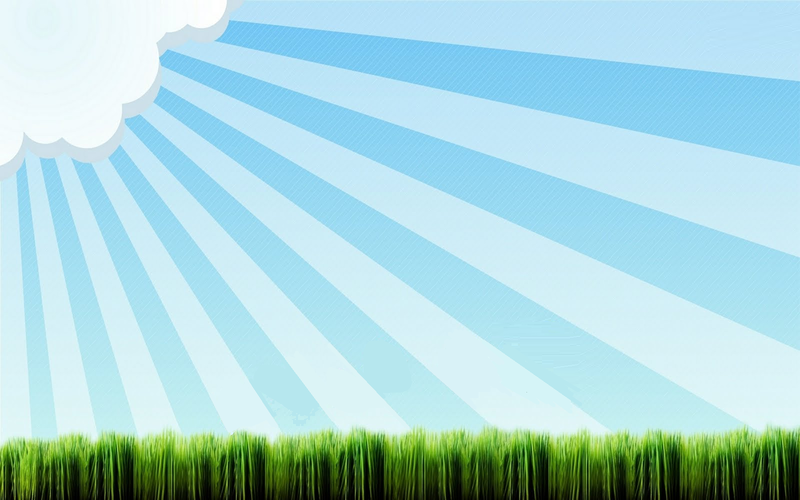 I like the grass & sky theme. It is adaptable & playful. The striped sky with 2 colors of blue was an early YES for the design. I like the simple broad stripes that give depth & are easier to paint. So I combined them & came up with this. Perfect shapes! (We'll get picky with color later) We can hang Angry Birds or castles or trees or whatever! Now onto the castle. CAT & DOT want a pink castle. I want to make a costume closet for their many costumes. So a castle wall/room will be the perfect princess backdrop. I picked out an irregular stone pattern (to look old castle like) that was square, easy to paint with tape! 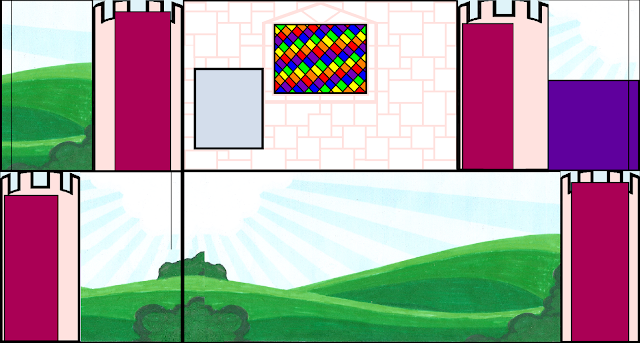 The grey picture I redrew out to the pink wall on Microsoft Paint. I liked the pink stone with light pink mortar the best. The wall is a great backdrop, but I needed a transition to the sky & grass. I tried balconies, windows, broken stone. None looked right or were easy to paint. After several days & dozens of drawings I finally decided on simple towers. Here are the best one I found for easy painting. I settled on the rounded top. Here I experimented with width & wrap around design. I haven't put a sun in the design because I may put one on the ceiling or make one to hang on the wall. Dirt poor, but the glass is half full. Small isolated town, very low income, can a mommy still be creative & happy? You betcha! Have you ever searched for design ideas for small spaces & on a shoestring budget? The results are mostly medium to large spaces with modest to large budgets. Quite frustrating for someone like me. 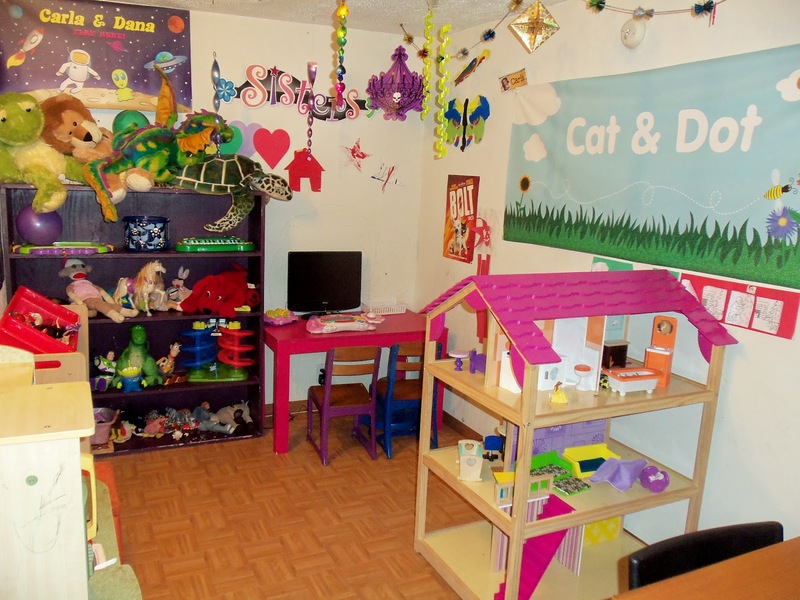 Where do you find practical advice for decorating a 690 square foot 43 year old mobile home? You don't find much. A tiny home & yard for a busy husband & creative mother of 2 young girls is a challenge to maximize efficiency & beauty.A challenge that I enjoy & I will share with you. With these hard economic times, I'm sure I'm not the only one living on way less than before. Maybe this blog can help or inspire some of you to make the most of what you have. After all, life is happening now. Don't waste it wanting another. Someone else would appreciate to have all that you have. Let's have fun! So I'm gonna start by laying out our floor plan. An accurate plan is crucial to decorating space for me. Every place I have ever lived, tiny apartment to suburb house, I've drawn up the plans for it. Have to know what you are working with to maximize it's use. I hand drew this plan on three sheets of graph paper glued to poster board & then foam board. It is about 13" x 26". The furniture is drawn on graph paper then glued to stiff board (like a Ritz box) then cut out. That way I can move the pieces around. We bought this 1969 mobile home, with addition, 4 years agofor $2000. It was a mess. We completely gutted & rebuilt the kitchen & bathroom with Home Depot sales. It took about 2 years to get it normal. Currently my husband is replacing walls & ceiling in the addition. That gives me a new opportunity to re paint the girl's playroom. Lots of ideas in mind. We'll cover them next post!